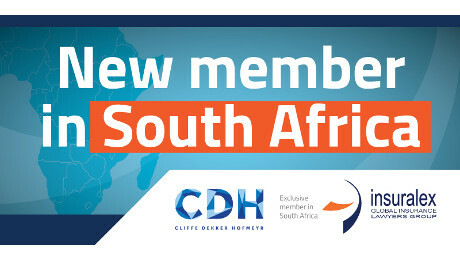 Cliffe Dekker Hofmeyr (CDH), a top ranked law firm and a provider of legal services in the area of insurance law and related litigation, announced today that it has become the exclusive member firm in South Africa for Insuralex Global Insurance Lawyers Group, the world’s leading insurance and reinsurance law firm network. As part of Insuralex, clients and Insuralex´s insurance law firms will have access to CDH’s recognised insurance and reinsurance coverage and litigation practices in South Africa. Insuralex is a worldwide association of independent insurance and reinsurance lawyers exclusively focused on the insurance and risk management communities. Insuralex is ranked in Global Chambers as a leading law firm network. Martín G. Argañaraz, President of Insuralex, commented, “After several years of providing legal advice from Europe, Asia, Latin America, the United States and Asia/Pacific regions the time has came to take another important step by expanding the network into Africa through a first-class South African insurance law firm”. Tim Fletcher National Practice Head: Dispute Resolution, said: “Cliffe Dekker Hofmeyr is delighted to be part of Insuralex. We look forward in particular to working with our new colleagues across the world and to growing the network into Africa”. We are able to provide experienced legal support and an authentic knowledge-based and cost-effective legal service for clients looking to do business in key markets across Africa. Our Africa practice brings together the resources and expertise of leading business law firms across the continent that have direct experience acting for governments, state agencies and multinational organisations. This combined experience across the continent produces an extensive African capability. We also partner with other professional disciplines such as audit, business consulting or corporate finance disciplines to provide a seamless and integrated solution for projects that have a multi-disciplinary dimension. Insurers have shown their confidence in us by retaining us to represent them in arbitrated or litigated disputes. Our clients include the top five life offices, a number of large short-term insurers, brokers and various financial services providers in South Africa and abroad. Disputes over insurance and reinsurance cover. Claims handling, monitoring and coordination. Directors and Officers (D&O) insurance, fiduciary, professional liability, and fidelity cover. Product and general liability cover. Claims related to insurance and reinsurance intermediaries. D&O and professional liability cover and defence. Suits between health insurers and providers. Disability or regulatory issues arising out of personnel policies.